Latitude:55 degrees 17.192 minutes N.
Longitude: 160degrees 32.214 minutes W.
Swell wave height: 0-1 ft.
Today I interviewed Nicola Samuelson, who is an ensign. Her job on the RAINIER is multi-faceted. She is responsible for the ship’s safety, must represent the Captain when he is not here, drive the ship from point A to B as assistant navigation officer, preparing the ship’s sail plan, and is also a morale officer, who plans activities for the crew when they are in port. She has an undergraduate degree and a master’s degree in ocean engineering. She works in four hour shifts and as an officer, may be on 24-hr. duty when the ship is in port. She chose this job because she enjoys the beautiful scenery, likes the important survey work they do, and enjoys working in a setting where you must bring a camera. She also has an interesting background that steered her in the direction of working for NOAA. She grew up on a sailing vessel as her parents sailed around the world. She was home schooled on the boat and sailed around the South Pacific from the time she was three years old until she was twelve years old. They would stop in various ports, such as New Caledonia, Fiji Islands, Samoa, New Zealand, Singapore, Malaysia, New Guinea, and Thailand when they needed to pick up supplies or work for a while. She only lived on land for the first time when she was 17 years old. She grew up speaking English and French as her parents spoke both languages. Because of her upbringing, she knew she wanted a job where she would be on the ocean. After graduate school, she received three months of NOAA officer training, where she learned firefighting skills, first aid, navigation, and how to drive a ship. She feels that her job is extremely significant, since some of the waters in Alaska have never been surveyed. An area that the RAINIER just surveyed, that covered 30 miles by 50 miles only had about 5 depth soundings. Ships would have to go around that area, because it’s just too dangerous to navigate through without the true depth measurements on the charts. A ship needs 40 feet of water clearance below deck level in order to successfully navigate the waters. 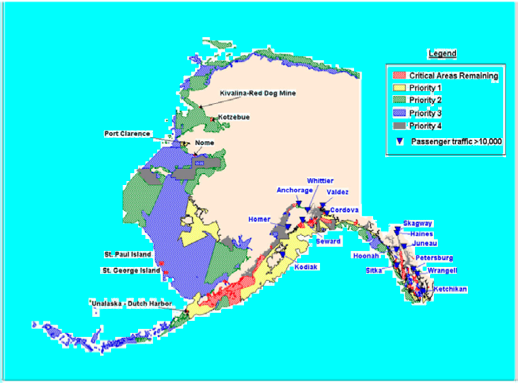 Lack of accurate charts means that cruise and cargo ships are limited in where they can sail in the Alaskan waters. Opening up new areas, because of their surveys, means NOAA is contributing toward improvement of safety, commerce and tourism. We have learned today, that because of an oil leak, the RAINIER will go into port early. We’ll have an all hands on deck meeting this afternoon to find out the exact plans. It will be interesting to find our how a ship this size will handle repairs. The weather has turned off pretty this afternoon, so those of the crew who are not working have gone on deck to fish. They will pack their catches in ice to mail back to their families. Fishing in Alaska is some of the best in the world! This entry was posted in 2004, Kathy Virdin, NOAA Teacher at Sea and tagged hydrography, interview, Nicola Samuelson, NOAA Corps, noaa ship rainier, oil. Bookmark the permalink.